Brushed aluminum first aid cabinet with two swing-out bins. Ideal for small offices. 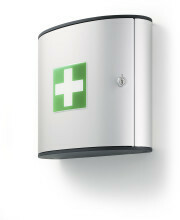 Brushed aluminum first aid cabinet with three swing-out bins. Perfect for commercial use.